inBlooom hand-printed canvas is made of 100% cotton. Could be used to make home textiles like cushions, curtains, etc. / Treasures of the Sea 2018 Saving the Ocean Treasures / The ocean covers approximately 70% of Earth's surface. Plenty resources can be found in the ocean. All kinds of fish, coral, other sea creatures, and even human beings get what they need from this large treasure box. Since human beings have asked too many things from the Earth, natural resources have become degradation and exhaustion. They are sending low but precise distress signals to us, trying to remind people to pay respect to the ocean. We've heard the calling, and we'd like to spread this message through our print. inBlooom hand-printed canvas is made of 100% cotton. Could be used to make home textiles like cushions, curtains, table runners, etc. Hand-printed canvas has a smaller width, only 85cm, with a plain margin of about 20cm for DIY users to make free uses. Boats There are many fishing boats on the sea. They carry back rich food for humans, but also carry back the faint cry of the ocean. 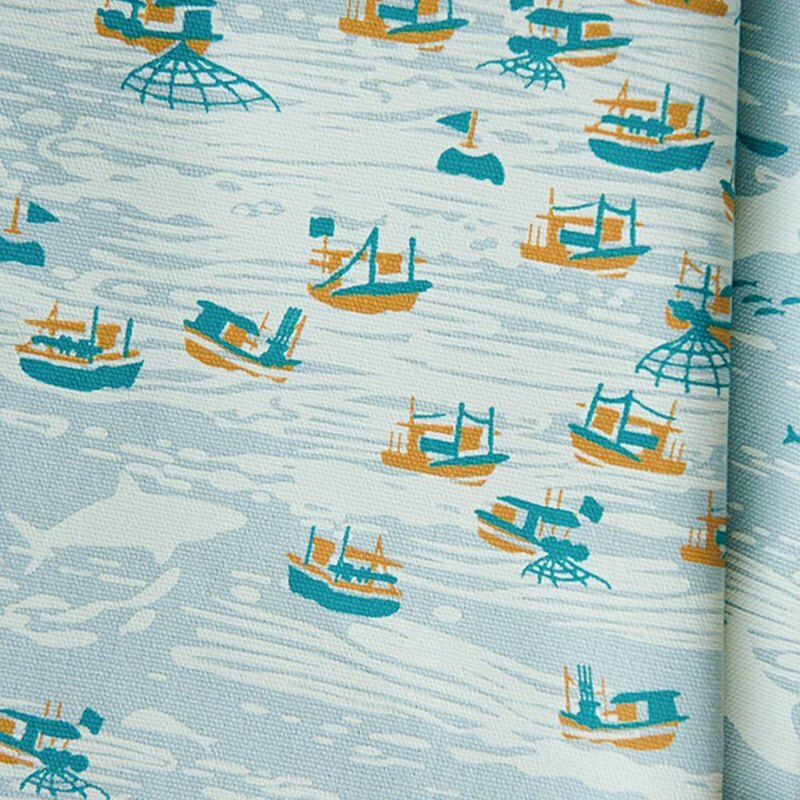 Pattern ｜ Boats, Water Blue Material ｜ 100% Cotton Size ｜ Fabric Width: 114cm, Pattern Width: 85cm Weight ｜ 400g/y Origin ｜ Taiwan Washing Note ｜ Hand wash. Wash with mesh laundry bags. Do not bleach. Do not dry-clean. * Printed fabric naturally fades over time due to sun exposure and repeated washing. ⇋ It is recommended to read before asking questions ⇋ ♪ Screen and the actual color will have color, the actual product shall prevail, please do not mind the color online shopping. ♪ Design Hall shipping day is Monday to Friday 10: 00-13: 00, weekends, national holidays can not be shipped. ♪ Super merchandise pick up refers to the goods within 48 hours after the arrival of super merchants, not within 48 hours you can receive items. ♪ Urgent items, please use the house to send out, and early communication to ask shipping time. ♪ Buy fabric For the code, please note in the order. ♪ Can not provide a single product modification, can not provide a single OEM. ♪ More questions please send a direct inquiry, we will reply as soon as possible.